A city in the Bay Area is pushing back against Chick-fil-A with rainbow and transgender flags. 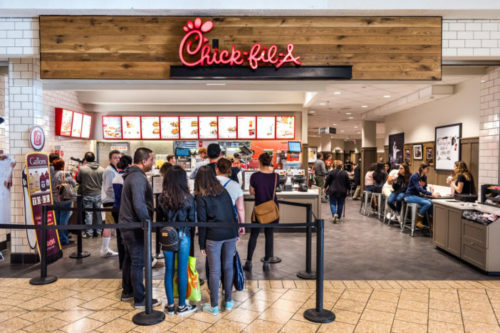 The San Jose City Council approved a contract last year that would allow several restaurants, including Chick-fil-A, to open locations in the Mineta San Jose International Airport. The fast food joint will open in just over a month. Yesterday, protestors went to city hall to register a complaint about the contract, citing Chick-fil-A’s donations to homophobic and transphobic organizations, which were over $1.8 million in 2017. “This is public space,” said Paul Escobar, the president of the local LGBTQ organization BAYMEC. The City Council took two votes to protest Chick-fil-A. First, they voted against a contract extension from 2026 to 2028 for businesses that aren’t open seven days a week, which includes Chick-fil-A. Second, they voted to put up rainbow and transgender flags around the Chick-fil-A. New York City and San Antonio, Texas, have refused to give permission to Chick-fil-A to open restaurants at their airports since ThinkProgress broke the story last month that Chick-fil-A was giving money to anti-LGBTQ organizations, according to the 2017 tax returns of their charitable branch. The restaurant came under fire in 2012 when large donations to the hate group Family Research Counsel and the ex-gay group Exodus International were uncovered.